The Jim McKay Natatorium, located in Fairfax, Virginia has been home to many competitions for record-breaking swimmers, including Michael Phelps, Kate Ziegler, Tom Dolan, and Ed Moses. This competition pool is fast due to it’s range of depths, temperature of the water, deep gutter system, and bulkheads that allow water to flow through it easily. In addition, the lane lines are non-turbulent and alleviate waves. The pool measures 25 yards by 50 meters and is surrounded by an all-tile deck. The pool utilizes a state-of-the-art automated pool filtration system that includes an ultraviolet system which helps reduce swimmers’ red eye, eliminates the smell of chlorine, improves natatorium air quality, and is effective in fighting bacteria. In 2012, management noticed cracks in the pool deck after the pool had been drained for regular maintenance. The facility is located at the lowest elevation level on the entire campus. This subjected it to groundwater runoff and increased lateral earth pressure on the pool. In order to prevent further damage, the fire department was called to refill the pool. But over the next two years, pool tiles continued to loosen from the deck. After consulting with engineers in 2014, it was discovered that the Shotcrete walls of the pool were designed to support properly drained soils. However, the western wall of the pool was under the constant hydrostatic pressure of the saturated soils that surrounded it, permeating the pool walls and weakening the deck’s tile mortar bed. Various repair options were considered to relieve the pool wall of the hydrostatic pressure, including the addition of permanent groundwater wells around the building perimeter, installing soil nails, injecting cementitious grout, and URETEK’s Deep Injection® Process. After research and thoughtful analysis, George Mason chose to use URETEK’s zero-excavation, polymer injection repair solutions for pool stabilization. URETEK’s many benefits such as it’s affordability, fast installation process, lightweight yet strong material, and history of success in stabilizing pools, structures, and weak soil strata far outweighed the other repair options. 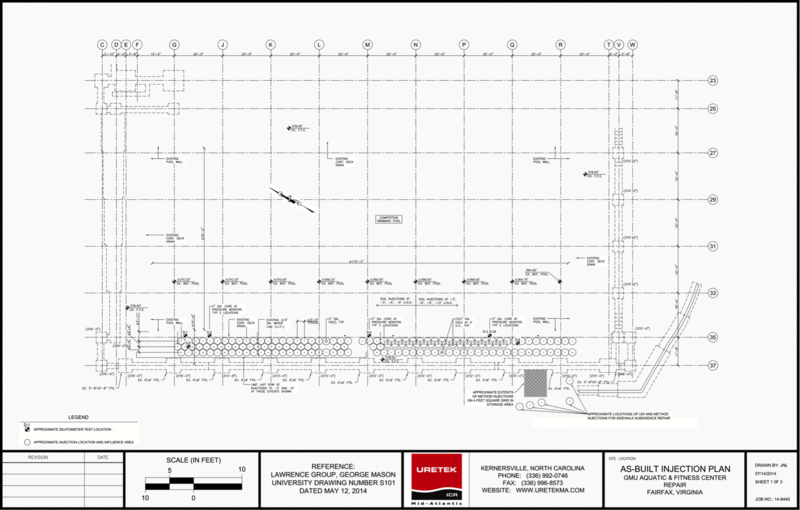 URETEK’s Deep Injection® Process was utilized for the pool’s remediation. URETEK’s patented injection process is a non-destructive, extremely effective soil compaction and densification process to improve load bearing capacity of weak or loose soil strata. It is very successful when applied into saturated soil environments due to the hydro-insensitive nature of the URETEK polymer material. URETEK successfully displaced the saturated soil without increasing the lateral load. The western wall of the pool was stabilized and the soils were compacted/densified, thus removing the hydrostatic pressure the pool walls were previously under. The repair was completed in less than 2 weeks. 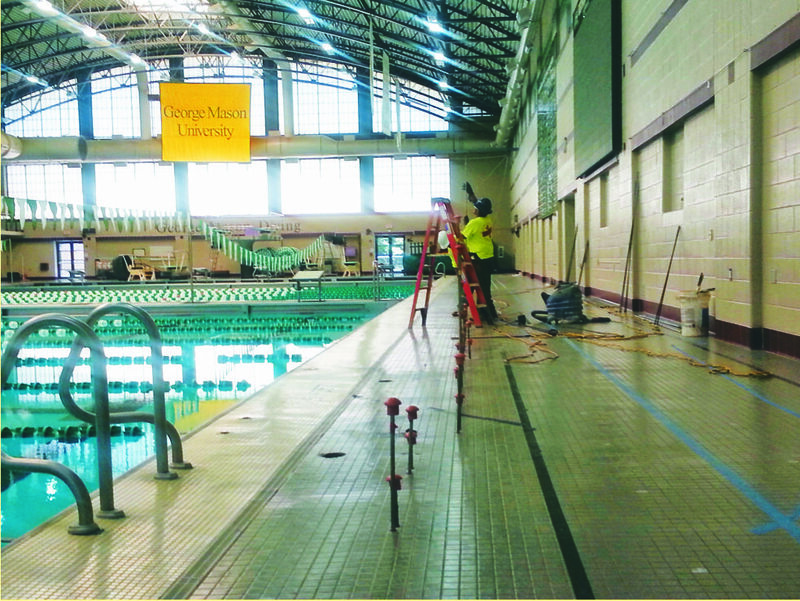 URETEK provided George Mason University with a cost-effective solution that quickly restored the aquatic center in time for the Fall semester’s competition season to start without delay!